Dr. Louis Creed (Jason Clarke), his wife Rachel (Amy Seimetz) and their two children relocate from the hustle and bustle of Boston to rural Maine. At peace for just a moment, the family’s new home and property begins to sour with the discovery of a strange burial ground located in the woods nearby. Meanwhile, friendly neighbor, Jud (John Lithgow), offers his assistance in welcoming the new family, but also offers a warning, sometimes dead is better. Based on Stephen King’s Novel with screenplay by Matt Greenburg and directed by Kevin Kölsch and Dennis Widmyer, this retelling of a now classic tale brings a thorough haunt with effective terrors and startles of a rural dark ride. Aptly handled by the ensemble, the delve into King’s psychological terror induces the audience quickly, even with telegraphed punches in clear sight. 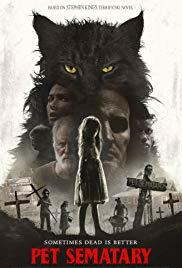 And note for fans of 1989’s Pet Sematary, yes, sufficient modifications are made to obscure and a keep the creep factor high enough for a fresh return, and somehow, perhaps also a little closer to the spirit of the original text? Prepare to get uncomfortable in your seat, the evil is back to stay. Pet Sematary is rated R.